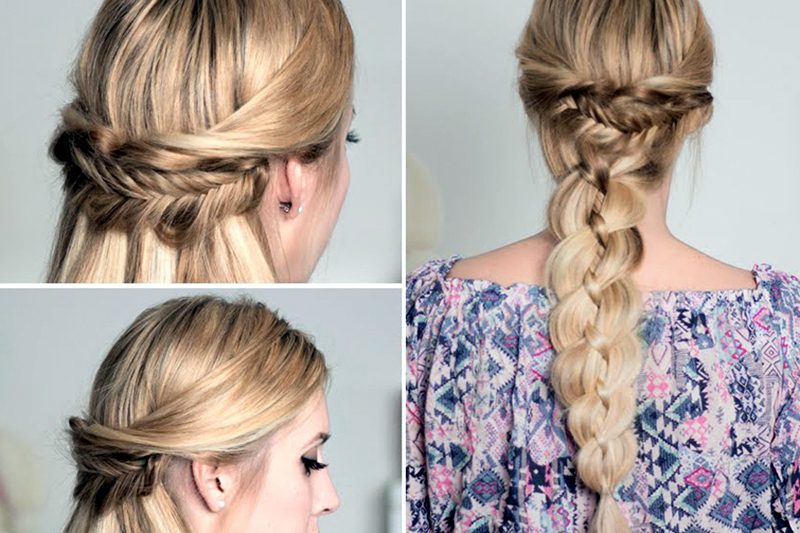 The half-up ponytail: Even though messy, it looks classy. Control the mess: Use a conditioner after washing your hair, as it strengthens the hair shaft, prevents split ends and detangles your hair without breaking them. After you have combed and dried your hair, always remember to use a serum, which should be according to your hair texture. Use serums that gives a smooth and shinny effect. Messy hairstyles: The easiest and the fastest way to manage your messy hair is to go for the right hairstyle. A messy bun, loose braids or a high pony tail will surely help you to tame those tresses. Or just go to your hairstylist and ask for their advice. Do for a haircut that will control the mess and give you a neat yest stylish look. [post_ads]Looped Fishtail with rubber bands: Pull your hair back into a low pony. Use tiny rubber elastic that blends in with the color of your hair. Split the hair in half just above the elastic. Loop the hair up and push the pony through the opening. Use rubber elastic to section off more hair just below the first. Make the same split as you did earlier. loop the hair up again and push it through the opening. Repeat as many times as per the length of your hair. Add in a head piece or other hair accessories to finish off the look. Twisted bun: Make two sections of your hair. Twist each section and tie with an elastic band to make a ponytail. Fold the ponytail, and wrap it around the elastic to make a bun. Secure the bun with bobby pins, and set it with a medium-hold hairspray. It is elegant and simple. You don't even need a mirror to do it. The half-up ponytail: Separate your hair into two sections-a smaller one that will be pulled into a pony and a thicker section that will be left down. Secure the top section at the crown of your head and wrap a tiny piece of hair around the base to hide your hair band. Even though messy, it looks classy. [post_ads]Headband tuck: Slide a stretchy headband over the crown of your head. Position the front of the headband so that it either rests on the top of your forehead or an inch or two back on top of your hair. Move the back portion of the headband wherever you want your tuck to be. A popular position is the nape of the neck.uck your hair into the headband. Begin from the front and work in sections. Take a strand of hair into your hand and roll it inward and underneath the headband. A low ponytail: Pull hair back into a low, loose ponytail and tie with elastic. Just above the elastic, divide hair in two. Tuck hair through the hole for a twist. Simple twist at its base and a jeweled hair pin is all your need to make your messy hair look wow.